CREEC Greenhouse Youth group worked a total of eight days in November; our Winter hours will continue to be Saturdays from 10- 2 and Wednesdays from 1:30 -5. We may schedule more work days with school being out. I will post additional days should they come up. November was a busy time of planting passion flower vines and other flowering plants around the mulberry tree and new gate installed by the California State Lands Commission. We planted passion flowers on CREEC’s fence as well. Our youth group took apart an overgrown water planter and replanted it with new plants. It was quite a task pulling apart those overgrown tulles, but with cooperation and one very bad word from me, the task was completed. We have tulles in 5 gallon pots for sale if anyone wants to start a water garden. We have planted every kind of oak tree known to grow in California. We’ve also planted toyons, cherries,buck eyes, pines, and many other grasses, flowering plant, and vegetable seeds. We will be potting up some of last seasons sprouted seedlings in December. The youth group spends at least a third of the time weeding. We weed each section looking for plants needing attention, As the plants show their needs, the students address each issue, either addressing it at the table being weeded or taking the plant to the work area for bigger pots or additional tools to complete the task. Along with most of the plants at CREEC Greenhouse, the youth group has planted many different winter vegetables and herbs available for sale during our work hours at CREEC. Feel free to stop by and visit us first. On that note, CREEC welcomes any pot donations. Drop them off in front of our gate and we will put them to good use. Should anyone want to support CREEC Greenhouse during this holiday season by giving plants or herbs, feel free to bring a pretty pot and we can pot it up with a plant of your choice. Our students would be delighted in the task. December brings the rain and wind and cold. Many plants take this time to rest, even dying back to the roots of the plant until spring. If you visit Creec these plants are marked with blue tags in the pot. The cold weather is also a good time to plant trees and perennial plants. CREEC Greenhouse hopes to replace the trees in the Restoration area just before CREEC’s property on Dowrellio Drive under the Carquenez Bridge on Saturday from 10 -2 December 16. From the freeway, go down Wanda to the bottom of the hill and turn left onto Dowrellio. Drive to the end and park. CREEC Greenhouse is on the left. We hope you can come. Thank you, to the board of directors for CREEC, our generous sponsors, C&H Sugar and Phillips, as well as our Friends of CREEC for allowing this wonderful place to be such an important part of what we do. The beauty and wonder are at CREEC Greenhouse waiting to be discovered by everyone. Come get dirty with us and see what is growing at CREEC Greenhouse. September, 2017, just flew by at CREEC Greenhouse. We have continued to water the restoration plants. Some have not survived the transplant and will be replaced, others are very happy in their new spot under the bridge. With the rain, we will get started. 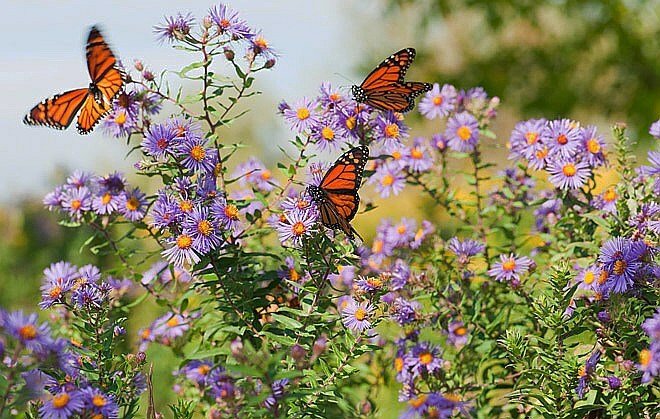 CREEC has lots of Native plants to bring back our butterflies. CREEC planted a mulberry tree a few years back across the road by a fence. Our Youth Group planted Sea Lavenders and California bee plants and some other future beautiful surprises under and around the tree. October will bring a few more! The butterflies and humming birds will love it! Ms Iris Wesselmann, Math/Science teacher at Carquinez Middle School, Friend of CREEC, Super Teacher who bribes us with marshmallows! visited CREEC with her classes(24 and 28 students) The 24 group class potted up seedlings of basil and salvia, 5 flats of each, !60 plants in all. They understand the life of a plant, root structure, stem, and leaves.They really liked mixing the soil in the wheelbarrow! The 28 group of students potted 1 gallon pots of ash and oak trees to 5 gallon pots so they could grow bigger. Almost everyone repotted a tree or 2. They loaded the labeled transplanted beauties and put them in a shaded spot with water. Both groups were excited and enthusiastic. CREEC, the treasure under the bridge, is being found out! due to the efforts of this wonderful woman! Several of her students have completed paperwork and are finishing their community service to be a part of CREEC’s Youth Group. In month of August the CREEC Youth Group has been very productive. We’ve removed the hay bale garden from in front of the greenhouse, transplanting the Salvias of many kinds and chamomile plants to pots. Then we staged and filled up tires with soil and planted a beautiful garden in the same spot. Dr. Dean Kelch picked the plants and designed the garden, filling the tires and planting some of the many plants with us. We mulched and watered and the project is splendidly beautiful’ with butterflies and bees and humming birds visiting. Everyone should come and see! We’ve also staged a “Plant Sale” area for Saturdays’ 10-1 advertised Plant Sale at CREEC. Although almost all of the plants at CREEC are for sale, we’ve put a large collection of Natives, flowers, vegetables, herbs, and trees all together for browsing. We have sweet potatoes in 1 gallon pots. CREEC has a great variety of beautiful plants, something for everyone. We are proud to announce the formation of the CREEC-David Hicks Memorial Scholarship Fund. A principle amount has been invested with a target to generate $1,200 to $1,500 per year and split equally between 2 deserving youngsters that have been involved with CREEC. The 2 scholarship winners will split the funds available at the end of every school year for their designated and declared, continued education plan, beginning with Class of 2018. The process: each spring, CREEC kids that are moving past high school and planning any sort of continued education, will submit an essay to the CREEC Board of Directors. The Board of Directors will then review and pass along all qualified applicant’s essays to the surviving family of original co-founder and original Board of Director, David Hicks. Dave passed away in early October, 2016. He was the guts of CREEC for over 20 years. Dave found it very rewarding to “get dirty” with the kids and watch their progress in life while working with CREEC, over the years. Many did not know that Dave placed a huge value on education, achieving a PHD himself. What better way to remember David Hicks than to invest funds from his CREEC efforts that will, in turn, allow continued education for CREEC youth? I hope this might motivate some kids to “get involved”. Thank you Dave Hicks for your years of dedication! CREEC Youth Group has taken on many tasks this month. We have mulched all of the restoration plants and water them 3 times a week. We’ve begun potting up the oak acorns planted this Spring into 4 inch tree pots. Last year’s acorns are moving into 5 gallon pots. we’ve removed part of the hay bale garden and replaced and planted 1 side of our new tire planter garden. There are still 2 very large salvias in the hay bales to move before completing the rest of the tire planters. We have new students completing their community service, learning the weeds, and the way to propagate plants. Most are happy and enthusiastic to be a part of CREEC. Richard Moody did some tree removal and planting, mowing, weedwacking, and tool repair. Our youth group came and planted lots of plants and trees on June 3rd in the restoration planting. We have been watering and mulching those plants as well as the second planting on June 17. Some of the trees have lost green in their leaves, others are happy to be planted. Like people, some take change better than others. Most of the plants in both plantings are showing signs of new growth and recovery from transplant shock. I am happy to report that all are mulched and marked so that we can water. After the planting on June 3, we mulched and watered. Then school got out soon after that and the students were too busy to come to work. We only worked 7 days in June, mostly watering, mulching, and staking trees. We made some clones and basil seedlings and weeded a little. Hopefully in July the youth group gets back on track. Summer work hours are Mondays and Thursdays from 7:30 am to 11:30 and Saturdays from 10-2. Richard Moody worked at repairing fences, wagons, wheelbarrows and water leaks and weed whacking. Thank-you for allowing CREEC to continue being such a big part of our week.